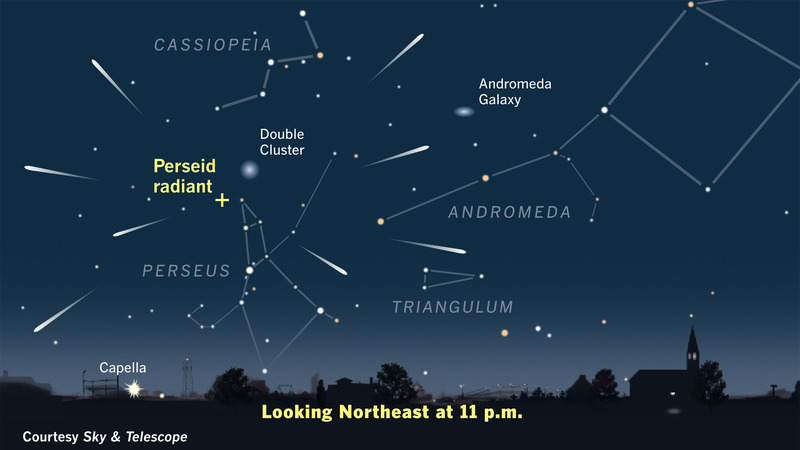 This year’s Perseid meteor shower could be the best in years! I captured a photo of a small meteor the night of August 10th-11th, 2016 from my backyard. I piggybacked my Canon 7D DSLR camera on my astrophotography telescope and equatorial mount so that I could take advantage of auto guiding for longer exposures. This is a manual stack of 6 x 1.5-minute exposures at ISO 1600. The night of August 11th-12th 2016 is expected to produce an outburst of Perseid’s not seen in 10 years. The Perseid meteor shower is considered to be the best showing of meteors in the night sky for the entire year. The warm August nights make the event extra enjoyable, as you can comfortably sit in a lawn chair and watch the whole show. The best time to catch a shooting star is after midnight when the moon sets, as this will result in a much darker sky. Below you will find tips on viewing the Perseid meteor shower, where to look, and how to photograph the event. 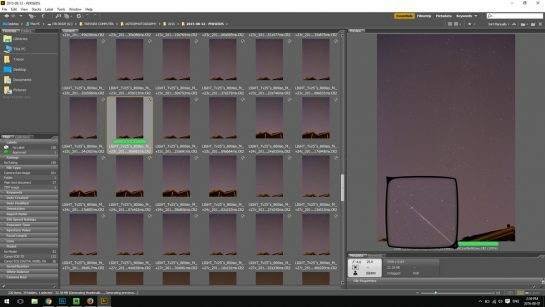 I even provide a brief astrophotography tutorial about how to create a composite image of this meteor shower. Every year in August, Earth passes through a stream of dust and debris left by the comet named Swift-Tuttle. It is interesting to note that there has been some debate as to whether this comet will eventually pass dangerously close to earth in just over 100 years. Further investigation into the possible catastrophe revealed that the comet’s orbit is more stable than originally thought. Phew! As Earth passes through the debris and particles left by Swift-Tuttle, those particles (meteorites) smash into the Earth’s atmosphere and burn up. 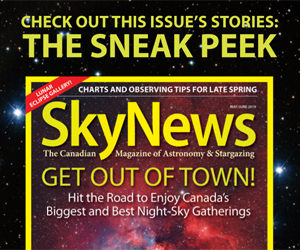 This event produces bright streaks of light across the sky that we see here on Earth as meteors, or shooting stars! 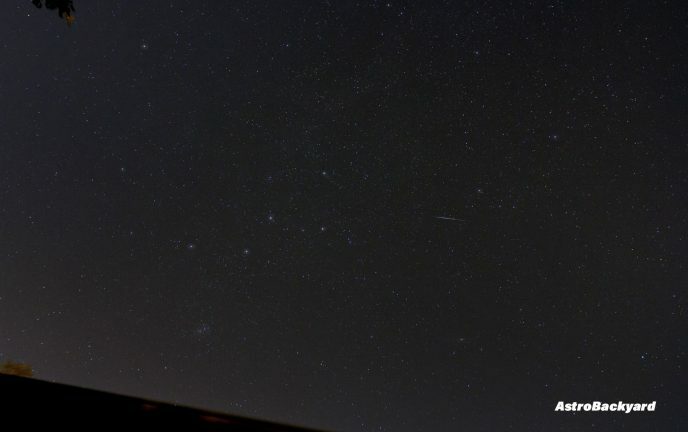 Many of these meteors are quite bright, and can cause a “wow” reaction from onlookers. Sharing the moment of a meteor streaking across the sky with someone is a feeling you won’t soon forget. Why is 2016 a special year for the Perseids? On a good year, the Perseid meteor shower will produce about 1 meteor per minute under dark, clear skies. During peak hours, as many as 2 meteors per minute are possible. This year, the rate of meteors could be up to 3 per minute! Dark skies are a must if you want to see as many meteors as possible. If you are lucky enough to own a cottage or camp somewhere with little to no light pollution, you will see even the faintest of shooting stars. If you can take in a wide panoramic view of the Eastern horizon, consider yourself spoiled! I haven’t decided whether I will travel for this meteor shower this year, or set up shop in the backyard. The explanation for the outburst this year has to do with the orbits of Jupiter and Saturn. The position of those planets in relation with the debris left by Comet Swift-Tuttle has Earth primed for an extra special show this year. You can begin looking for shooting stars at around 10pm when the Perseids are at the official peak. 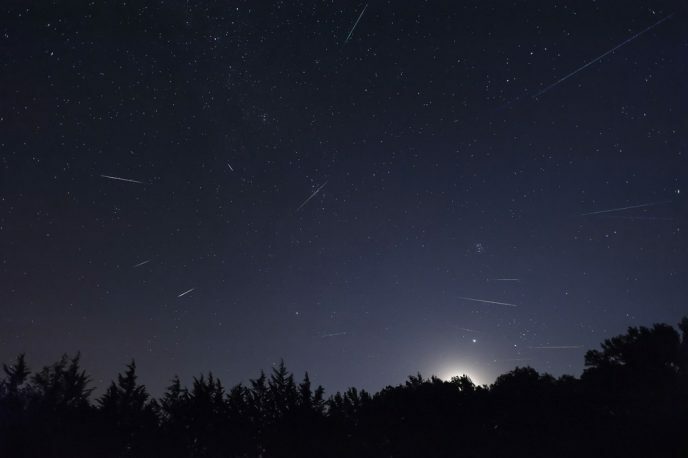 Although the moon will still be up, the Perseids are known for producing some very bright meteors that can be seen even when the sky is not completely dark. At this time of the night, the constellation Perseus will appear low in the sky, and the meteors will enter the atmosphere at a shallow angle. These meteors can be quite the spectacle! These are known as “grazing” meteors that can last multiple seconds, and travel a wide distance across the sky. I remember seeing the brightest, longest lasting meteor of my life in this scenario years ago from a friends backyard. Perseus is south of the constellation Cassiopeia, which looks like a big “W” of stars. This constellation will stand out as soon as it starts to get dark out, even under light polluted skies from the city. If you can’t spot Perseus right away, just use Cassiopeia as a reference point in the sky. If you own a DSLR camera and a tripod, you’re in luck. You have everything needed to capture beautiful photos of this celestial event! A copy of Adobe Photoshop will also help you create a composition photo of multiple meteors streaking across the sky at once. A point-and-shoot digital camera, such as a Canon Powershot or Nikon Coolpix may also be capable of capturing this event, as long as it has a manual mode with long exposure capabilities. The main idea behind this process is that you will leave your camera shutter open for an extended period of time, for a better chance at capturing a meteor streaking across the sky. Taking a series of long exposures over the duration of the event gives you a solid chance at capturing the action! By shooting continuous 30-second exposures, your camera will have a constant eye to the sky. Using photographic accessories can help automate your imaging session, and give you a better chance at catching a few meteor photos. A simple intervalometer will allow you to program the camera to take continuous exposures for an extended period of time. The Canon timer remote controller has many features including an interval timer and exposure count setting. 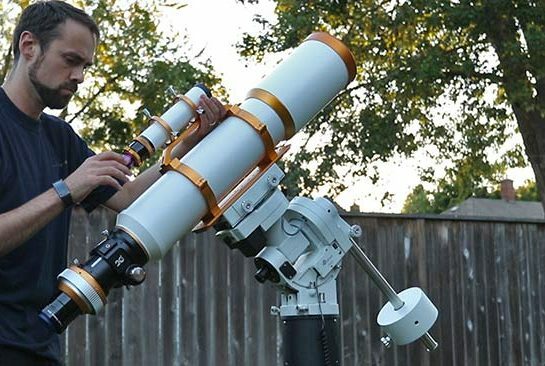 This would do a great job of setting your camera to record the Perseid’s. You can also use software on your computer to automate your imaging. BackyardEOS is a fantastic program for astrophotographers, and I use it for my personal deep-sky astrophotography exclusively. BackyardEOS can also be utilized in situations like meteor showers, as it works as an interval timer for your DSLR. For example, you could set your camera to take 100 x 30-second shots at ISO 800. The frames are then downloaded to your laptop with plenty of storage room. For the best results, make sure your computer has lots of hard drive storage space, and your DSLR has an AC power adapter. Running out of storage space or battery power can ruin your night in a hurry! When shooting your series of images, it is important to not move your positioning. Choose your initial framing carefully, because you will be sticking with it for the rest of the night! The process of combining your images taken during the meteor shower is rather simple, but it will make a big difference in the impact your shot makes. 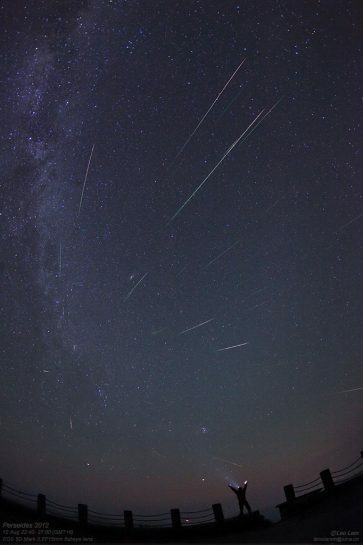 The idea is to create a single image containing every meteor you captured throughout the night. If you captured enough Perseid meteors (that came streaking out of the radiant point), you will have the elements needed to produce an image that dynamically represents the events that took place that night! 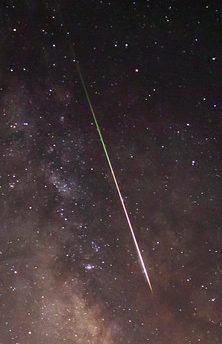 Start by reviewing your photos, and try to isolate the shots that contain a meteor streaking across the sky. This can be very exciting, especially if you caught a bright one! Ideally, you will have at least 3-4 shots that contain meteors, but the more the better. 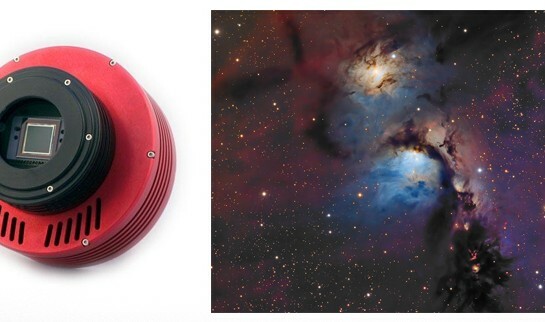 Now, register, stack and process a “base image” of your night sky. A stack of about 10 x 30-second exposures should give you a nice smooth image containing a sky full of stars and constellations. You can process this image to pull out some fainter stars, balance the background sky, and reduce noise. This will be the underlying layer of stars for your meteor shower composite. If you were able to include an interesting foreground subject, bonus points to you! Next, take your meteor frames you selected earlier and place them on top of your base image as layers. Set these layers to “lighten” blending mode in Photoshop, to reveal only the meteor, but not the noisy, unprocessed background sky. You can subtly process your meteor frames to brighten the meteor slightly, but don’t over do it. Do this with all of your meteor frames, to create a master file with every meteor that occurred during your session. You can then flatten the image (or create a new adjustment layer) and do some overall image edits. 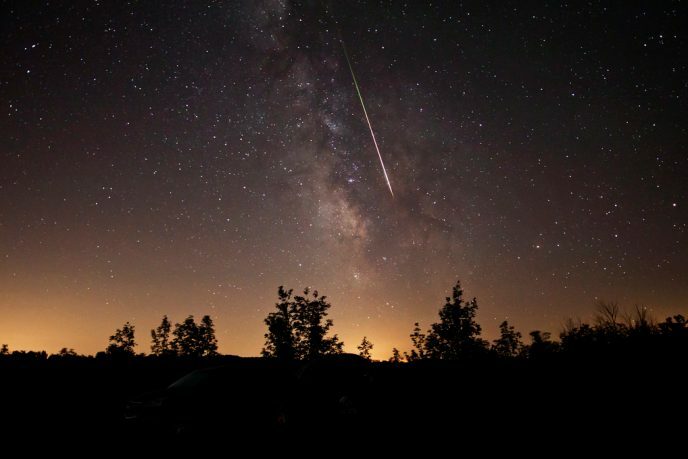 Follow me on Twitter or Facebook for my latest updates on the 2016 Perseid meteor shower!